What to do with the lingering congestion in your nasal passages after a cold, sinus infection, or upper respiratory infection? That is right, a simple warm saline irrigation with a Neti Pot can work wonders. 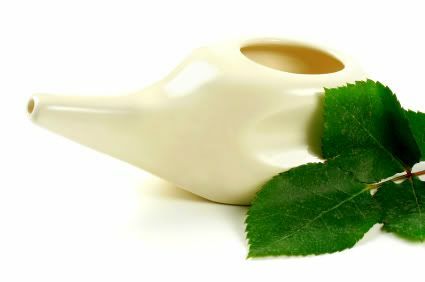 A Neti Pot is used to clean the nasal passages and ensure free airflow through both nostrils. It is part of the treatment protocol for nasal congestion, allergies, sinus infections, colds, and many other ailments. The dust, dirt, pollen, and smoke that gets trapped by the nasal mucosa can easily be washed away by this simple procedure. Porcelain Neti Pots made specifically for the nasal wash are available. Alternatively, a small regular watering can may be used if reserved only for this use. 1. Pour 8 ounces of warm water into the pot. It should be clean or filtered water, free of contaminants. Water that is too cool may increase congestion, while water that is too warm may cause irritation of the delicate lining of the nose. 2. Stir pure, non-iodized salt into the water until it is completely dissolved. The amount depends on how finely ground the salt is. Use ¼ teaspoon with finely ground salt such as table salt, or ½ teaspoon with coarse varieties like kosher salt or sea salt. The resulting saline solution should not burn. 3. Lean over the sink so that you are looking directly into the basin, then rotate your head to the side so that one nostril is directly above the other. The forehead should remain level with the chin or slightly higher. Insert the spout into the upper nostril until it makes a comfortable seal. Keeping your mouth open, pour the solution into the upper nostril and let it drain out through the lower. You should be able to breath comfortably through your mouth. If the solution drains into your mouth, lower your forehead in relation to your chin. Continue pouring until the pot is empty. 4. Exhale vigorously through your nose to clear excess mucus and water. Quickly draw the abdomen toward the spine during each exhalation. If using a tissue, be sure not to pinch the nostrils closed. Continue until they are both clear. 5. Mix another batch of saline in the pot and repeat the procedure on the other side, again exhaling vigorously to clear the nasal passages. 6. It may be necessary to do additional techniques to clear remaining saline solution from your nose. a. Bend forward, pointing the top of your head towards the floor. Hold for a few seconds then return to standing and do some vigorous exhalations. b. Stand with feet 2-3 feet apart and arms out to the side. Slowly bend from the waist bringing the right hand to the left knee. Look up at your left hand stretched up towards the ceiling. Hold for a few seconds and repeat on the other side. Exhale vigorously through the nose. Himalayan International Institute of Yoga Science and Philosophy. Neti Pot. Honesdale, PA. 1994. Stevia the Alternative Sweetner of Choice!